First and foremost if you are working parents or not, make sure that your baby gets milk or his/her dinner by 8pm. Hungry babies will become very cranky and settling down to sleep will be quite challenging. 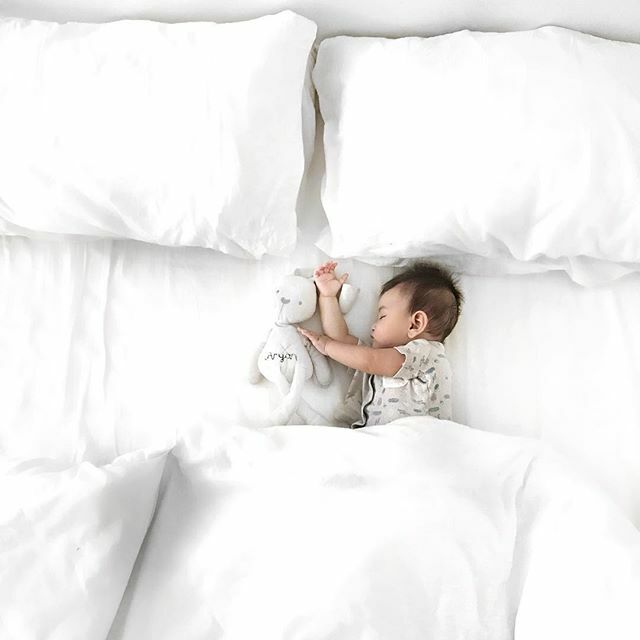 As hard as it is as babies do not know how to follow the time and often goes to sleep whenever they feel like it, try to set a consistent time. For example, if 9.00pm your baby seems giddy and happy, play with him to tire him out so that by 10.00pm you could rock him to sleep. Although you must know that this might change every now and then as your baby grows up. For my baby, he only takes a nap at 8.00pm and ends up waking up for a couple of hours after for playtime. But as soon as the clock strikes 11.00pm or if he shows signs of yawning or rubbing his eyes, we know it is time for the bedtime ritual to start. See point below. However, be flexible if your baby seems to stay up late than usual. Okay, this point always come up in a lot of these kind of topics but it is crucially important. Create a bedtime ritual which will in time make your lil one understand that is time to get ready to sleep. Some people bathe their baby with warm water as a cue while some read their baby a bedtime story. Well it didn't work for our baby (lol) but it is not impossible that it does work for some. However, for us, we wipe his body with a warm soaked towel, wash his face, changed his diaper, give him a bottle of his milk and while the baby is drinking his milk, we pretend we are asleep. When our baby makes a sound and tries to wake us up, we pretended to be sound asleep and to our astonishment, he slept on his own. DO take note, this worked when he turned 8 months old. Before that, we had to rock him in his bouncer to sleep. Do not leave the light on just because you feel or think that your lil one will be afraid. This is because they are still too young to understand. The dark as a matter of fact helps to get your baby's body into sleep mode faster as your body releases melatonin, a hormone which helps the body transition to sleep. Even as adults falls asleep easier in the dark. Okay, if you try to put him down for his sleep while he is active, you will know that he will not be ready for bed. So to tire him out, give him toys or entertain him for an hour or two until he gets drowsy. Your baby will definitely fall asleep easier when he/she feels exhausted. So how did you experimented in setting that bedtime routine for your baby? Feel free to share your experiences in the comment section below.